Ever increasing energy consumption across the world continues to drive the rise in the investments and discoveries globally. Continued technological developments within the upstream market have improved drilling efficiency as well as increased the drilling activities in regions such as North America, Middle East and Africa. Current fairly settled oil prices are expected to influence the demand for associated drilling equipment such as drill bits, drill pipe, and casings. The global oilfield equipment rental market size in projected to reach USD 20.55 Billion by 2022, largely due to technological advancements in oilfield equipment, increasing global exploration and production and growing unconventional hydrocarbon production in North America. Ongoing new product developments by leading companies for drilling are likely to propel further growth of the oilfield equipment rental the long-term forecast. The demand for customized drilling equipment is driven by the increasing volume and complexity of well requirements to meet global production targets. Technologically advanced rigs are mostly used for horizontal drilling. Rental equipment providers are expected to maintain inventory of wide variety of equipment with a lot of flexibility which in turn rises the capital needs. Oil and gas operators and other players need to be environmental regulations compliant. These environmental regulations are stringent and change periodically. They effect all activities across the value chain around exploration, development, and production, limiting the growth of the market demand for equipment and its rental. This research study involved the use of extensive secondary sources, directories, and databases, such as Hoover’s, Bloomberg Businessweek, Factiva, and OneSource, to identify and collect information useful for a technical, market-oriented, and commercial study of the global oilfield equipment rental market. 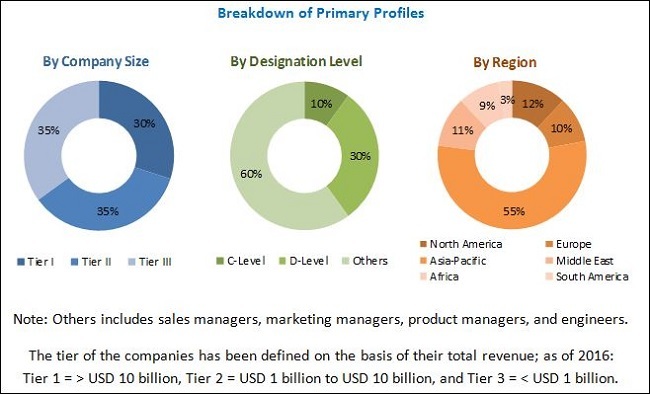 Primary sources are mainly industry experts from core and related industries, preferred suppliers, manufacturers, distributors, service providers, technology developers, standard and certification organizations of companies, and organizations related to all the segments of this industry’s value chain. The points given below explain the research methodology. The value chain starts with the identification of suitable areas to conduct exploration for oil and/or gas. After initial exploration the petroleum fields are appraised, developed, and produced. These activities are carried out with the help of oilfield equipment which includes a wide range of drilling, pressure and flow control, and fishing equipment. Equipment such as frac tanks, mud tanks, mixing tanks, and separating tanks are also used during various phases of exploration and production. These equipment are further categorized as drill pipes, drill collars, subs, hevi-wate, BOPs, and valves by oilfield equipment rental companies. Halliburton Company (U.S.), Schlumberger Limited (U.S.), Weatherford International, PLC (Switzerland), and Superior Energy Services, Inc. (U.S.) are some of the leading oilfield equipment rental suppliers, which provide a complete range of equipment for onshore and offshore applications. Crude oil prices are hovering around USD 70 a barrel and likely to remain so for few years, how this is likely to influence equipment rental market in the short and long terms future? How are the digital transformations in the oil and gas industry likely to impact the equipment rental market? Who are the key players with significant operational and pricing advantages? The global oilfield equipment rental market is projected to grow at a CAGR of 3.87% from 2017 to 2022, to reach a market size of USD 20.55 Billion by 2022. Increasing technological advancements in oilfield equipment, rising global investments in Exploration & Production (E&P), growing drilling activity, and increasing unconventional hydrocarbon production in North America would drive the oilfield equipment rental market in the forecast period. The report segments the oilfield equipment rental market based on equipment into drilling equipment, pressure & flow control equipment, fishing equipment, and other equipment. Drilling equipment dominated the equipment segment due to rise in drilling activities in North America, the Middle East, and Africa to meet the energy demand. This considerable increase in the drilling activity is expected to create demand for associated drilling equipment such as drill bits, drill pipe, and casings. 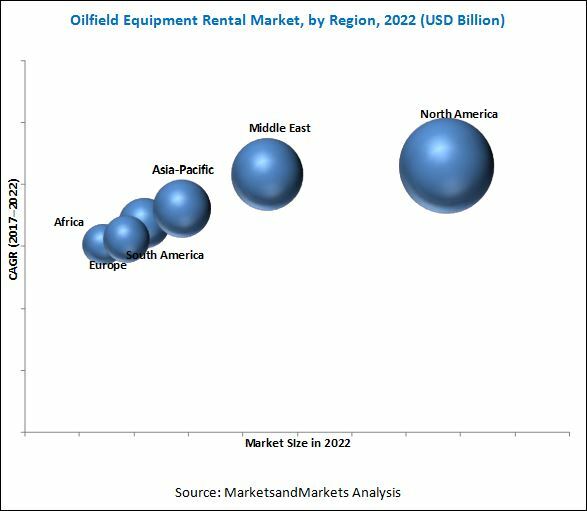 Based on application, oilfield equipment rental market is segmented into onshore and offshore segments. Onshore is the largest segment for the oilfield equipment rental market. The presence of huge onshore shale reserves in the U.S. and Australia, is likely to boost the demand for onshore oilfields. Customized demands by drillers and uncertain regulatory framework is expected to slow down the demand for the oilfield equipment rental market during the forecast period. However, the oilfield rental equipment market has potential in refracturing activities in the U.S. and emerging offshore opportunities. 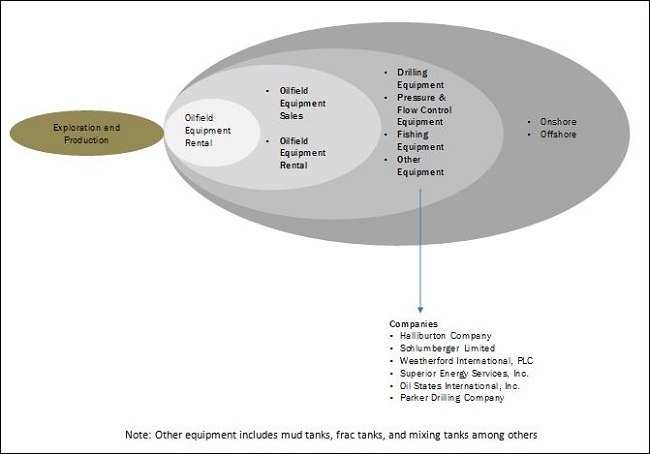 Some of the leading players in the oilfield equipment rental market includes Halliburton Company (U.S.), Schlumberger Limited (U.S.), Weatherford International, PLC (Switzerland), Superior Energy Services, Inc. (U.S.), Oil States International, Inc. (U.S.), and Parker Drilling Company (U.S.) among others. Mergers & acquisitions and contracts & agreements were the most adopted strategies by players to ensure their dominance in the market. Onshore activities are typically higher compared to offshore, and so are the respective rental needs on the oilfield equipment. Increasing demand for rental equipment from China, Southeast Asia, and the Middle East is expected to drive demand growth in the onshore segment. Also, huge shale reserves in the US and Australia are likely to augment the demand from onshore oilfields. In 2016, onshore rig count stood around 97% in North America, and 87% in the Middle East. Offshore oil and gas activities are highly capital-intensive. The Gulf of Mexico, and the North Sea regions dominate the offshore market for equipment rentals. West Africa, Malaysia, and the offshore regions of Venezuela and Brazil are emerging markets with slightly swift growth rates. 5.2.3.1 Refracturing Activities in the U.S.
10.3 Superior Energy Services, Inc.
10.4 Oil States International, Inc.
10.8 Seventy Seven Energy, Inc.
10.9 Basic Energy Services, Inc.
10.10 Key Energy Services, Inc.
10.12 Circle T Service & Rental, Ltd.
10.13 Ensign Energy Services, Inc.